Hogg’s Hollow is named after James Hogg, a Scotsman from Lanarkshire, who settled here in 1824. Hogg operated a whisky distillery and a grist mill, and was considered the most successful of all the millers in the valley. In 1856 James Hogg’s sons John and William, subdivided their late fathers estate under the name “Hogg’s Hollow”. The Hogg’s Hollow subdivision included one hundred and forty-one lots however only a handful of houses were actually built at this time. Four of the original Hogg’s Hollow houses are still standing. These include two former mill workers cottages, that were relocated in 1986 to 4150 Yonge Street, where they now serve as the entrance to the Auberge du Pommier Restaurant. The other two original houses are located at number one and number five Old Yonge Street. Both of these houses have undergone extensive renovations. The Jolly Miller tavern, circa 1857, situated at 3885 Yonge Street, and the George S. Pratt House, circa 1886, located at 17 Mill Street, are the other historic landmarks in this neighbourhood. The present day Hogg’s Hollow neighbourhood began to be subdivided in the 1920’s. This neighbourhood grew in stages and was finally completed in the 1960’s. Heading north on Yonge Street, past the prominent Loblaws superstore with the cedar shingled roof motorists begin a descent down a steep valley. As you make your way down into the valley, you will see blue and white Hogg’s Hollow street signs that beckon you to discover where they might lead. Follow these signs and you will be in the storybook neighbourhood of Hogg’s Hollow. Hogg’s Hollow is an enchanted place set in the rustic beauty of the Don River valley. Here you will find winding crescents and private culs de sac lined with a colour guard of majestic Maple, Birch, Pine, Spruce and Willow Trees. There is even a stone bridge in the middle of this neighbourhood under which the Don River gently flows on its winding course towards Lake Ontario. Hogg’s Hollow’s idyllic charm comes with a huge price tag as this is one of Toronto’s most expensive neighbourhoods. 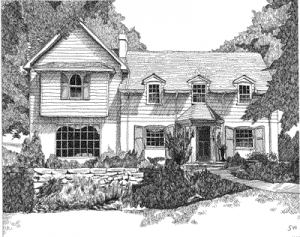 Hogg’s Hollow houses are set in a lush landscape with a hill and dale topography that is left unfettered and in its original state without the intrusion of sidewalks. Hogg’s Hollow houses were built over a long period of time between the 1920’s and 1960’s, which accounts for the curious mixture of English Cottage, Tudor, Colonial, Georgian and Modernist architecture found here. Freshly painted window shutters adorn many of these houses and picket fences are also popular. Hogg’s Hollow also contains luxury condominium townhouses and apartment buildings on the brow of the Yonge Street hill, overlooking the valley. 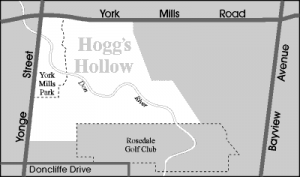 Hogg’s Hollow residents can walk to the York Mills Centre located at the north-east corner of Yonge Street and York Mills Road. This centre includes retail shops and services, medical offices and a food court. The Yonge Street shopping district to the south of Hogg’s Hollow is anchored by a Loblaws Super Store, which features a garden centre and a take out restaurant. Continuing south on Yonge Street you will find clothing stores, professional and medical offices, restaurants and basic household services. The oldest and most prestigious municipal course, Don Valley has a classic Howard Watson design, a traditional variety of holes, and a reputation for its exciting, natural setting. It’s a challenge to even the most skilled of golfers. Don Valley is located at 4200 Yonge St., just south of Highway 401. For more information or to book a tee time, call 416-392-2465. Hogg’s Hollow residents can walk to the York Mills subway station entrances at either Old York Mills Road or inside the York Mills Centre. The York Mills station is also a Go Transit station that includes an express bus service to the Pearson International Airport. Yonge Street provides motorists with a direct route downtown in only twenty minutes. For commuters the Yonge Street on-ramp to Highway 401 is just a few minutes north.